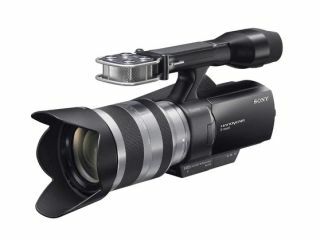 Sony has unveiled its latest moviemaking creation which brings high-end specs to the consumer camcorder market, the Sony NEX-VG10E. Adding an interchangeable lens system to a camcorder means that users can choose which lens to shoot footage on – with the system being compatible with E Mount lenses found on Sony's NEX-3 and NEX-5 and lenses from Sony's existing DSLR line-up, courtesy of a LA-EA1 mount adapter. Image quality on the VG10E is Full HD 1920x1080, with the footage captured to AVCHD with a bitrate of 24 Mbps. Inside the VG10E is a14.2MP Exmor APS HD CMOS sensor (nearly 20 times bigger than your average camcorder sensor), 14x optical zoom and in-built Optical SteadyShot image stabilisation. The sensor size will be a big draw for prosumers, as it means that you can achieve an extremely shallow depth of field, which will make your movies feel that little bit more cinematic. At if that wasn't impressive enough, there is also a 'Spatial Array Stereo' microphone on board and a 3 inch-type Xtra Fine LCD. Sony is keeping to its dual memory format for the time-being, so you have the choice of shooting to Memory Stick Pro Duo or SD card. To make sure you will be able to edit all your footage, Sony is also adding a copy of Vegas Movie Studio HD Platinum 10 into the mix. The NEX-VG10E has a UK release date of September with pricing to be announced.